Staring Emma Thompson, Tom Hanks, and Colin Farrell, it focuses on author PL Travers as Walt Disney tries to woo her into a movie version of Mary Poppins. Half of the movie is told in flashback to Travers’ childhood and her relationship with her father, played by Farrell. While a bit overlong, the story is charming and moving. All three leads shine, especially Thompson, and some of the best scenes involve the three writers working with Travers and moments with her chauffer, played by Paul Giamatti. At its core, the story is about letting go of the past. This Wednesday, March 26 – Milo James Fowler will be at the Insecure Writer’s Support Group site, so be sure to stop by. Carrie Butler’s Honesty (Mark of Nexus #2.5) is now available! Nicole Singer posted funny, failsafe blogging tips. This was my favorite - when all else fails, mention Firefly! The Hostile Smile by Pat Hatt is now available – this makes book #31! And we are now just one week away from the start of the fifth A to Z Challenge! In anticipation of her debut cover reveal on Monday, March 31st, Melissa Maygrove is sharing some teaser images this week. A trivia question has been paired with each one. It’s a contest! Hop around to participating blogs and collect all 7 answers, then give them to Melissa by Saturday. Your answers don’t have to be correct to win, but you must submit a complete list by the deadline to be entered in the drawing for the giveaway. The prize is a free e-copy of her book once it’s published and a $10 gift certificate to either Amazon or Barnes & Noble. Hosted by Damyanti’s team, you can visit team member Jemima Pett for the full list of participants. I’m going retro this year – every day will be a movie or music feature (matching the alphabet) that corresponds with a given year. There will also be fun facts and information with each year – cost of a house, world events, sports, and movies, music, and games released. Where does the feature come in? Each year was chosen because something significant happened to a blogger buddy that year, and they will be featured! It’s always a new batch of blogger buddies for the Challenge, but this year it’s wide open, so be watching – you never know who I will feature or when! Anyone else see Saving Mr. Banks? Excited about the new and upcoming releases? Think you can solve Melissa’s puzzle? What’s your theme for the Challenge? And what do you think of mine? My work project is almost done, but due to health issues within my family, I will be completely off the grid at the end of this week. (I’ll try to check emails once or twice a day.) My next post will be April 1, day one of the Challenge. Thanks for understanding. I love your theme! I can't wait to read your A to Z posts! I think we all understand that health issues within your family have to be your priority for the rest of the week. I hope everything is okay. I do hope that your family health issues are resolved quickly. And I, and your other stalkers, will happily welcome you back. I loved Saving Mr. Banks. I especially loved at the very end, the real audio of the one of the meetings. Great theme! I can't wait to see what retro things you've got. Hope all is well with the family, see you in April! What an exciting theme, I am sure you will put some interesting and intriguing facts together. I hope things go okay with the family, see you April 1. Hi Alex - I hope all will be well with your family's health issues - I'll be think of you. I haven't seen Saving Mr Banks yet - but it's definitely one I want to see .. I'm a huge, huge fan of Saving Mr. Banks. Thought it was last year's best movie and all. Alex - thanks for sharing my cover today!! I won't be A-Zing this year. Much too busy. BUT I will be lurking around since I know I'll find some good stuff. Looking forward to your posts. I love your theme! Looking forward to your A-Z posts. Elephant's Child, thank you, and nice to know I have stalker. Lynda, that was really cool, wasn't it? Hilary, I think you will really enjoy them. Tony, it was really good. Brian, thanks, and think everything will be all right. I haven't seen 'Saving Mr Banks' but it sounds as if it's worth seeing. I like the idea of 'letting go of the past'. I can't wait for your Retro Feature. I know I must be in there somewhere! I hope your family member will recover. My prayers are with you. Can't wait to see Saving Mr. Banks. Congrats to Melissa and everyone else. Your theme sounds intriguing, looking forward to it. Family always comes first. I'll keep your family in my heart and prayers. I happened to see Saving Mr. Banks in the theater and loved it. It helps that I watched Mary Poppins growing up, so a lot of it felt very nostalgic for me. But the writing and acting was excellent, that's what did it. I loved that one scene between Emma and her driver. I read that the script writer had to write that scene over like 22 times to get it right. Have with A to Z! Oh good...glad to hear Saving Mr. Banks is recommended. That's one I was interested in seeing. Nice message, it sounds like, too. Great theme, Alex! I'll enjoy the blasts from the past. Thanks for helping with the contest, Alex. You rock! I don't know how you do it. Have you cloned yourself by some chance? Set clone 1 to working on the A-Z, clone 2 returns blog visits, clone 3 collects ninja news while the real Captain Ninja Alex gets to have a job, go to the movies, and tend to family. That's got to be the answer. Awwwww - sending you and your family lots of healing hugs, positive light and good thoughts! Hope all goes well with you. Yay for your A-Z theme!! Looking forward to it! Love the A-Z theme, as a movie junkie I can't wait to see each post. I really wanted to see SMB in theaters but couldn't get there. I was wondering if it should be a by or a rent. Hope all is well with your family, will be praying. Sounds like a fun theme! We haven't officially revealed our theme for Indie Writers Monthly, but we'll be focusing on indie books. I loved Saving Mr. Banks. Emma Thompson was amazing! I'm looking forward to your A-Z posts too! What fun! Happy Monday, Alex! Sorry about the family health issues. I hope everything is okay. We loved Saving Mr. Banks. I thought it did an excellent job of showing how something in a character's past impact how they view the work and his/her interactions with it. I like the idea of going retro Alex - can't wait to see what you do with it! That sounds like a really cool theme. I'm looking forward to seeing what you're going to do with it. I've got "Saving Mr. Banks" on my To See list - love Paul GIamatti! We saw "The Book Thief" - absolutely wonderful but tissues definitely required. I can't wait to read your A-Z posts - your theme sounds like so much fun! Hope the health issues all work out for the best. You had me at "retro," Alex. I'm planning on checking out Saving Mr. Banks. The trailer looked quite interesting. Still have yet to watch Saving Mr. Banks, have to get on that. A great theme too, movies, music and bloggers together can't lose. Hopefully the health stuff goes for the better as well. Oh dear, health issues are always a problem and definitely you need to take time to deal with them. I do hope they will be resolved satisfactorily. Good luck with that. Haven't seen Saving Mr. Banks but certainly intend to do so, I love Emma Thomson and Tom Hanks, neither of them can go wrong in my book. Your theme sounds like a lot of hard work. You are a glutton for punishment aren't you? Look forward to reading what you write. Great idea for a theme. I hope your family is doing okay. Glad you are able to go offer support. Take care! I hope everyone in your family gets back to healthy soon. Your theme sounds like a lot of fun! So sorry you are dealing with health issues in your family, Alex. I hope all is well soon. Love your theme and look forward to the posts. Take care! Lots of great news, and that's a very clever way to do a cover reveal. Awesome theme for the Challenge! I hope all will be well with your family. Still haven't seen Saving Mr. Banks, but will. Your A-Z theme is right up my alley. I love that kind of stuff. Really looking forward to it - especially learning more about your blogger buddies. So it sounds like I should check out Saving Mr. Banks. Mr. Banks, not my bag. But going retro? YES. I see many NES games in that picture, which strikes a chord with my inner 80s nerd (who never grew up or went away). Enjoy time with your family and make sure YOU stay in good health, too. Oh, interesting theme. Bet it's going to be fun! Pulling for your family, Alex. Melissa's cover reveal puzzle looks fun! Congrats to Pat on #31!! Glad to hear a recommendation for Saving Mr. Banks. It's on my growing list of need-to-see movies. I love your theme! You always have something great going on and and terrific about lifting up others. I'll be praying for your family's issues. Take care of yourself so you can be available for them. Alex, I hope your family health issues are resolving quickly and easily and whomever is ill gets well very soon. I did see Saving Mr. Banks and loved it, especially Emma Thompson's performance. I thought she deserved a nomination for Best Actress. I still haven't seen Mr. Banks though my mom thinks I'll love it. I wish I had more down time. I think the puzzle contest thing is such a fun idea. And I love your theme for A to Z. I'll be sharing writing music--should be simple and different. I hope whatever health issues are going on in your family, everything turns out okay! Laura, even that movie had issues! Vicki, that's how I roll! Jo, I do like to make it difficult, don't I? Jay, there will be a few years you really dig. Brandon and Bryan, mine never went away either. Birgit, glad you're on board for the Challenge! Thanks for the thoughts and prayers, everyone. Wishing your family good health. 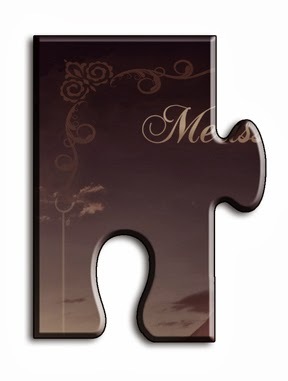 Love the puzzle piece reveal idea! Great A-Z theme- should be a lot of fun! I don't know. Perhaps one day I'll take on the A to Z Challenge. In the meantime I think I'll just have fun reading yours everyday. I bet you'll put in more work on this challenge than most people put into a whole year's worth of blogging. Retro feature sounds cool. I'm sure it will be awesome! What a cool idea, Alex! Saving Mr. Banks looks like a cute movie, although I haven't seen it yet. The jigsaw cover reveal idea is really neat! I also thought that Saving Mr. Banks was a wonderful movie! The jigsaw puzzle contest is such an original idea. Speaking of original, I love your retro theme for A to Z! You always go all out for the challenge! Sending lots of good thoughts out to you and your family, Alex. Ken, as usual, my theme turned into a monster as I gathered each post. Cindy, you must watch it!! Sorry to hear of your family health issues, sending my best wishes to you. I have to go check out Melissa's blog to see the questions, I'm now intrigued. Best wishes with the health issues in your family. See you on the 1st. Alex! I'm a retro girl at heart, so I'll be following your A to Z with great interest. Thanks for the recommendation on Mr. Banks, as well. I was on the fence about that one. Once more, you've swayed me into seeing a movie that I'm sure will appease! 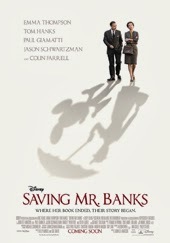 "Saving Mr. Banks" sounds like a great film with a great cast. I will check it out thanks to your recommendation. I love the idea of the puzzle challenge, but the link is dead. Retro theme! I love it! I love Melissa cover reveal! Very clever. I hope everything is okay with your family. Take care. Sending healing thoughts your way. Yes, I like your theme for A to Z, very interesting and I think it will be fun! Hope all goes well at work. I'll be praying for your familys health. Your theme sounds great and very interesting. Will probably make me feel old. I think I will see Saving Mr. Banks. Love Tom Hanks in most anything. I loved Saving Mr. Banks. It was one of my favorite movies last year. That's a really ambitious theme for the Challenge. It must've taken a lot of time to put each post together. Patricia, sorry I was late. Randi lee, you will really like it. Maurice, I'll fix the link - thanks. Your retro feature sounds really cool for the A-Z challenge! Pat Hatt is on a roll with all those books! Giamatti was excellent in Banks. My husband and I both loved his character and what he brought to the film. "Saving Mr. Banks" is on my to watch list. We really enjoyed "Saving Mr. Banks". We just saw "The Grand Budapest Hotel" and highly recommend it. We are Wes Anderson fans, and he stays true to his quirky humor. Which is why we love him. I saw Saving Mr. Banks with my mom and I really enjoyed it. I love your them and retro is so cool! Can't wait to read your post. Totally understand the need to go off the grid. You take care of your family and we'll eagerly await your return. Prayers that all goes well. If you need anything, don't hesitate to ask! I think I will wait to rent Mr. Banks. Just doesn't excite me. And I'm not a flashback fan. I was wondering how Saving Mr. Banks was - so thanks for the info and review. Sounds like you have a great theme for A to Z! Can't believe it's almost here. Hope all goes well with your family member. Will pray. Love your A to Z challenge. Sounds like a lot of work though. Saving Mr. Banks was robbed, I tell you! Robbed! Suze, he always plays an interesting character. And I knew you would dig my theme. Thanks, Elizabeth. Sorry you won't be joining us, but know when to say when. Interesting theme for A to Z. I'll look forward to following. Saving Mr. Banks sounds like a good movie. Hope to check it out. Alex, I hope everything with you is ok! Sending you good vibes, my friend. And thanks for the recommendation about Saving Mr. Banks. I was iffy on the premise but I do love Tom Hanks. Nice idea for a theme, looking forward to the trip down memory lane. I agree Mr. Banks was a little overlong, but it was a good film to see with my mom over Christmas. I also enjoyed the writers' scenes (naturally!) and Emma Thompson is just wonderful. I'm especially looking forward to the music. As usual, lots going on in the book publishing world. Hope things improve soon for those in your family who are not feeling so well. Love your theme and can't wait to find out the movies you've chosen to blog about! Totally, Alex. I'll keep you and your family in my prayers. Since I'll be on a break in April, I'll see you in May. I'm wishing you and your family the best. Great theme. I love anything retro. I love the idea of puzzles for a teaser. Thought the trailer for "Saving Mr. Banks" looked good. I'll take your recommendation and ask for free popcorn at the theater as well. A To Z challenge: my first year participating. I'm doing a travel themed month from our holida spent on a cruise out of Barcelona, Spain with a couple of extra days at the end, also in Barcelona. Yes, there will be photos of me on a donkey, a camel and a few other surprises. Stephsco, that's a good one! Carol, thanks, and will miss you. Dean, those pictures will rock! Its funny how the simple stuff works! I'm following Nichole. Saving Mr Banks is a cool movie, not quite what you'd expect. Its unpredictable nature kept me hooked. I enjoyed your review of Saving Mr. Banks and the various Ninja news shared. Lots going on with bloggy buds all around. Hope things are okay and will see ya when you returns. Sending prayers your way. I'm so excited for Melissa's book. I think this is a fun way to do a cover reveal. Looking forward to your Retro theme. I love your theme for A to Z, can't wait to see what you come up with. I was wondering about Saving Mr. Banks. Glad to know you recommend it. Hope the health issues with your family are better soon. Can't wait for your A-to-Z theme. It's always fun to see the old movies. I heard a lot about Saving Mr Banks when I was in Europe, with interviews with Tom Hanks. I'm looking forward to seeing it. So much blogger news. Thank you. I can't wait to read your A-Z posts! I love your theme and I look forward to reading your posts! I'm sitting it out this year due to my book release and I'm considering doing the April Camp NaNo to finish a novella I started, but can't get myself to continue working on. Good luck! thinking of you and yours and sending Hugs! Hope your family's doing well by now! I swear, almost every time I come here, I'm the 111th person to comment. So weird! But... I'm still dying to see Saving Mr. Banks. Really wanted to see that in the theater, but never made it. I wanted to see Mr. Banks when it was at the theaters but missed it, so I'll catch it on TV. The new releases sound great, and Melissa's idea for the teaser cover release is just too good! I hope the health issues with your family are very quickly resolved, Alex. Take care. I like the idea of the retro theme because I'm retro. Your A-Z posts are going to be great fun, Alex. I'm looking forward. PS Thanks for wishing me chocolate men. They haven't arrived yet, but I'm sure they're on the way. Krista, hope you finish that story. Lee, hope the years go back far enough for you. Robyn, keep checking your mail. Another great theme Alex, I am looking forward to see who you feature. Sorry to hear about the family health issues. Hope everything turns out okay. My kids liked Saving Mr. Banks. Mary Poppins is one of my favorite movies. Your theme sounds like you did extensive research. It will be fun to read. I'm focusing on food this year. Getting hungry already for the challenge to start! Oh, I want to see Saving Mr. Banks. Sounds wonderful. I've read several people taking aim at Saving Mr. Banks for being too pro-Walt Disney, even calling it propaganda over the conflicts. Did any of that ring true for you, Alex? I'm loving your retro theme idea. Very cool. Yes, I'm looking forward to seeing Saving Mr. Banks but there are so many interesting movies coming out--my list is getting long. Especially since I prefer watching movies at home with a chihuahua in my lap and a bowl of popcorn nearby. May those you love soon be well and all be set right with your world. Alex-- Great ninja news today. I will be thinking and praying for you and your family today (about the health issues). Best wishes. I'm dying to see Saving Mr Banks, but will have to wait until it comes on satellite. I'm glad you liked it! Congrats to Carrie, Pat and Terri! I love Melissa's puzzle idea! So cute! Your retro idea is GREAT! It's amazing what things used to cost. I hope you can locate some old advertisements from each time period - those are hilarious! Anyway, I hope the entire Cavanaugh clan is back up to full health soon. Take care. John, I didn't get that vibe. It was more about Travers than anything and focused on her internal conflicts. Nate, can I record it on 8-track and mail each one? I have been considering Saving Mr. Banks. Thanks for the review. It helps. I hope those health issues get sorted! Glad you liked Saving Mr. Banks. I want to see it too. And awesome A-Z challenge idea. Great theme. I haven't seen Saving Mr. Banks. Congrats to those with Ninja news! I'm going to have fun making movie lists from your posts during the AtoZ! Mellissa's cover reveal sounds like a great idea. I'll have to see how smart I am in answering her questions. Haven't seen Saving Mr. Banks, but since Emma Thompson is one of my favorite actors, I will. MJ, thanks and glad you're on the team. I'm looking forward to your theme! I've never seen Saving Mr. Banks, but I want to. Good luck! Your theme sounds like fun! And yeah, I'm getting back to the online groove. Funny how satisfying it is to take a break, yet I hate missing all the fun, but I really miss folks like you. Wishing you and yours good health! Hope all is well with your family. Sending prayers your way! Love your theme! Going Retro--awesome! I look forward to reading your posts. In the meantime, take care of your family, that's the most important thing. See ya in a week! Yes, just the interpretation of Emma Thompson should see the movie Saving Mr. Banks! That's such a wonderful theme! I can't wait to see what years (and bloggers) you feature! I enjoyed Saving Mr. Banks too. My favorite, favorite scene was when one of the brothers was singing Feed the Birds and Walt walked in. I'm going to Disney World next, wahoo! My prayers are with you & your family. See you in A to Z. Your retro theme will be most interesting. Although you will know I find the A to Z too much of a clique thing. I do respect all who attempt it. The fact it hijacks the blogging world for all of April is something I'll have to live with. The most important thing is that your family situation is the priority. Please try and take it easy, Alex. heading your way. I am sure you will be missed while you are off the grid. as I like to say peace & light..
What an awesome post! I can't wait to check out your posts. You did an excellent job coming up with a theme. Sorry to hear about the health issues with your family. Hope they are better soon! I think you've outdone yourself on this year's theme...egads, you do like to go the edge of sanity don't you??? LOL. It will be great and I can't wait to meet more of your buddies. Praying for your parents. Take care, and see you next week. You're A to Z theme sounds like a lot of work Alex. I going for short and simple this year, making it very easy on me and super easy on those who come to visit. I've been a bit skeptical about Saving Mr. Banks, but I think I'll give it a try now! Praying for the Fam! Your theme sounds awesome! Can't wait to check it out. I hope your family feels better soon. Yup, it's official, I'm going Retro. On your blog, ha. You think of all sorts of fun and interesting topics Alex. Sadly Mr. Banks took forever to come to Jamaica and then popped in and out. But I always thought the trailers showed a touching movie. That puzzler looks interesting to say the least. Have a great day Alex. P.S. : I'm also super excited about seeing Divergent on Thursday. Melissa's puzzle piece is such a cute idea! Yolanda, still time. And we've missed you. Kristin, we have a big screen 3D television, but I still like to hit the theater. Jess, I really struggled and was happy to finally decide on a theme. Tina, I'm a glutton for punishment. Oh, great theme! So fun - and so in line with your generous nature. Thanks, Alex; you're such a great blogging buddy, and set such an awesome example for the rest of us! Great theme Alex! And how could I (of all people) not understand health issues keeping you away? I sure have had my share this year... hope everything is alright. God willing you'll be back soon and commenting away in no time. Hugs! Glad you liked saving Mr. Banks. I really want to see it, but haven't gotten a chance, yet. I can't even believe this is the 5th year of A-Z! I signed up for the 2nd and think I managed half the posts, lol. I'm a terrible blogger. Here's hoping to improved health for your family! Here's hoping you and your family are back to peek health by the end of the week. Here, have some cheese to speed the process. I hoped to see this movie-guess Mr. Banks is being saved for Blue-ray. Sending you my thoughts and prayers, in regards to your family! It doesn't surprise me that you are going retro in the A-Z! That fits you, Mr. Cavanaugh. :) I love Carrie Butler's writing and will have to go and grab that book. Crystal, some years were challenging, so it gave me options. So sorry to hear about the health issues Alex, will keep you and your family in my prayers. Ooy am I late. But I have a good reason. I installed Mavericks and my mac crashed. Had to pull the macbook out of the closet, then set about trying to remember where I hid the other cords. Oy vey is right. But I digress. Congrats to Carrie and the rest. the covers look great. And I'm so glad you liked Saving Mr. Banks. I was hoping it would be good, but my success ration hasn't been great lately. Happy A-Z challenge, Alex. The retro theme sounds really fun and I hope everyone's okay and feeling better soon! I didn't really like 'Mr. Banks'. I was troubled by the portrayal of Walt as being so manipulative. Probably true, but I would rather live with my delusions of him. It must be Spring...all those book releases. Have fun with the A to Z thing. Hope all turns out well for you and yours. Ah, Melissa's bringing out a book too! I feel like the world has swept right by me. YAY, Melissa! Sounds like a great theme, Alex. I love Emma Thompson and have a soft spot for Mary Poppins. That movie and memories of my grandmother are synonymous. Love the idea with the puzzle pieces...if only I had time to participate. Saving Mr. Banks is definitely a movie I recommend. and I'm praying for you and your family. I saw Saving Mr. Banks and loved it! I'm not much of a movie goer, but I'd go more often if there were more movies like this one. And the retro theme is SO YOU. That'll be perfect. You're someone I wish I knew in real life, cuz I think you'd be way fun to talk music with! I'm sorry to hear you're dealing with stressful health issues in the family, Alex. I will keep you and yours in my thoughts. That's an intriguing theme for the April challenge. I hope the health issue within your family is resolved soon. So glad you enjoyed Mr Banks, Alex. I did too. Emma Thompson was absolutely hilarious to watch. Sorry about the health issues ... hope all works out. Great theme! You're full of great ideas. Congrats to the newly published, and see you in April. The puzzle contest sounds great but I do not have time for that. I'm happy that I find time to visit a few blogs. I hope the health issues within your family can be cured soon. I think you know that your followers are patient. Love your retro theme and am really looking forward to seeing it in action. I haven't seen Saving Mr. Banks -- yet -- but it's definitely at the top of my Netflix list as I adore Mary Poppins. Plus, who can resist that cast??? Your theme seems like a really fun and funky way to get to know people better. Very original! Don't think I've come across anything quite like it. As you are likely aware, I'm participating in AtoZ, as well. My topic is writing in general and my current work-in-progress in particular. See you around! Saving Mr. Banks is one of the few movies I actually want to see. And your theme sounds fun. Enjoy! Awesome theme! Retro, well, I hope you add some Duran Duran, Cars, and Tears for Fears to the mix. Good luck with all things A-to-Z! I haven't seen Saving Mr. Banks yet, but hope to soon. Not sure if it's out on video yet. Alex, I hope your family's health issues are resolved quickly. Your A-Z Challenge theme is great. 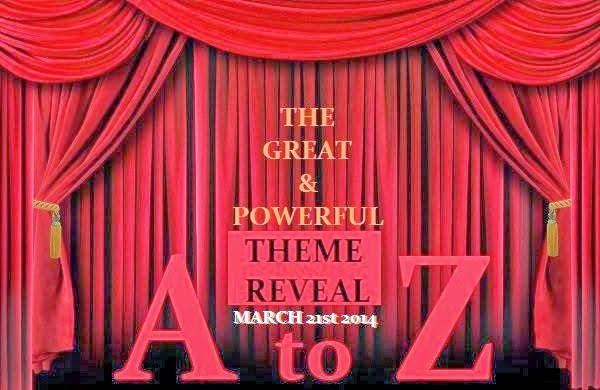 My A-Z theme reveal post will go up today. My decision to join the Challenge was a bit late. But better late than never. I'm doing A to Z this year with the Untethered Realms group and our theme is fantastical creatures. Should be fun. best of luck in dealing with your family health issues. Is it the month for it? I've run across at least three or four bloggers who mentioned the same thing. What exactly is a metal alloy rings? I do hope that the health issues are sorted and your family member is recovering well. Best wishes, and thank you. I hope that your family health issues are resolved quickly. Sorry to hear about you family's health issues... Take care, and I'll be praying for you! Yes, I did see Saving Mr Banks and LOVED it! Excellent. Congrats to all and their new books and cover reveals! All the best to you! I wanted to see that movie as soon as I saw the advertisement- Tom Hanks and Emma Thompson together? Sold! HUGE congrats to Carrie, Pat, Terri and Melissa! And I'm not at all surprised to see you've selected another rockin' theme this year. Cause you rock. And thanks for the recommendation for Saving Mr. Banks. I'll have to check it out. I can not wait to see your posts for the challenge. This is my fist time and I do not have a theme just playing it by ear. hope everything with your family and the health issues work out. A. I love the Retro idea (and that retro picture!). Looking forward you keeping up with you during April. I like your idea for A to Z. Awesome theme! Posts involving history/facts perk my ears up! (Well, not literally. At least no one has ever said anything.) It's always fun to compare prices, entertainment and fads from the past. Looking forward to it! One day till the challenge. Hope the health issues heal up soon, Alex. Thanks for the IWSG invite, and I'm looking forward to your retro A2Z posts.